This photo gives a nice overall size of the resonator. Here is the power controller for the White Night. A variac stack controls the AC voltages that are supplied to the inputs of the 15KVA pig transformer. The variac stack is an autotransformer that can drive the pole pig inputs with lower than normal voltages, or it can drive the pole pig inputs with higher than normal voltages. 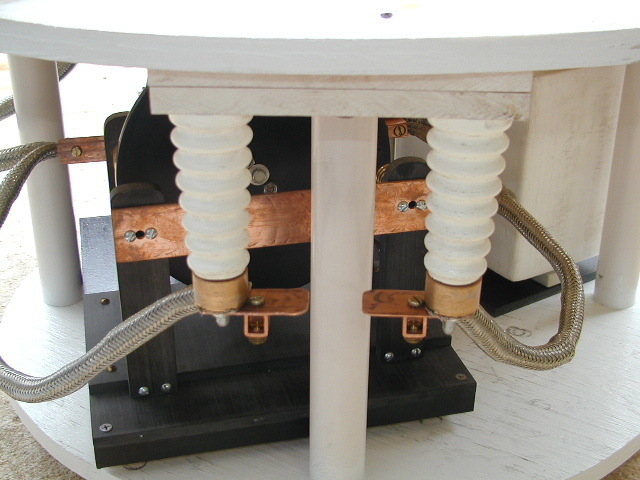 This is a very well designed power source for driving Tesla Coils. This is a nice photo of the White Night outside Area 8393 . You can see the design of keeping the high voltage power supply away from the resonator, and performing the current chopping, break rate, and tank directly under the resonator. This arrangement makes it less likely that a streamer will hit the power trasformers. Here is the asynchronous spark gap for the White Night. Pure tungsten rods will be added to the brass holders. 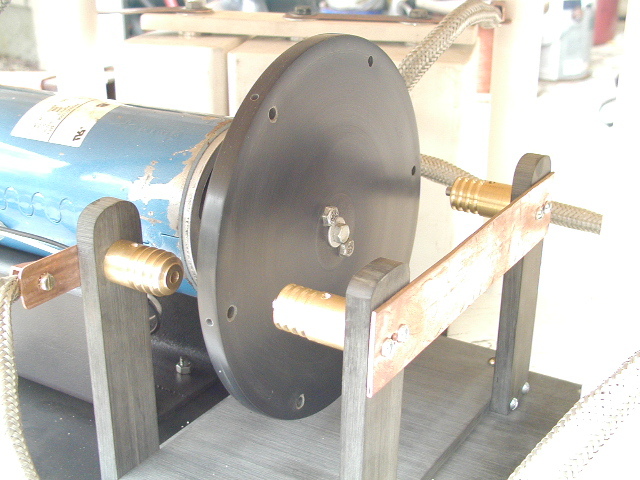 This is a DC 2.5 HP motor with a solid phenol disk and supporting structure controlled by an independent variac. There are four conductive nodes and six rotating nodes on the plate. Every revolution provides 24 potential breaks per revolution. These are powerful asynchronous motors which can spin faster than 3600 RPM. Here is a shot of the bus bars insulators and heavy duty wire that has been used in this project. All wiring is extremely overbuilt. Overbuilt is how we build Tesla Coils. Rugged and powerful. Our structures are very strong and state of the art. Check out the chain link wire diameter running from the gap back into the power supply! Here is a shot of the White Knight in the early evening. It is throwing an 11 foot ground strike onto the driveway right away. This coil is very loud as compared to some of our other coils, and when the rotary spark gap is slowed down, it makes a very deep sounding buzzing sound, that you can feel in you chest. This coil is not tuned well yet. We expect amazing results when we have everything in order.